Crew aboard the International Space Station are preparing for a busy run-up to Christmas, with a Cygnus space truck to unload, three new residents due to arrive next week, followed by a Russian resupply mission slated to launch to the orbiting outpost shortly after. 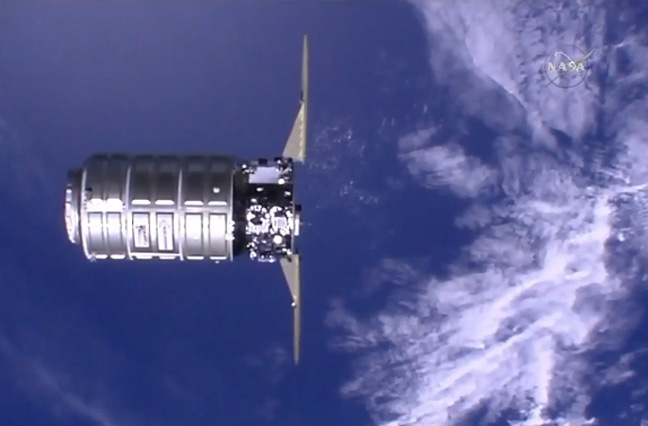 The Orbital ATK Cygnus resupply vehicle mated with the ISS yesterday, bearing 3,500kg of scientific experiments and essential supplies. NASA 'nauts Scott Kelly and Kjell Lindgren used the Canadarm2 robotic limb to grapple the spacecraft and dock it to the station's Unity module. Kelly is commander of Expedition 45, and is currently some 257 days into his One Year Crew partnership with cosmonaut Mikhail Kornienko. Expedition 45 flight engineers Lindgren, cosmonaut Oleg Kononenko and Japan's Kimiya Yuiare are packing their bags to return to Earth on 11 December aboard the Soyuz TMA-17M* capsule. The trio will have spent 141 days in space since launching from Baikonur Cosmodrome in Kazakhstan back in July. Their departure marks the beginning of Expedition 46, with just Kelly, Kornienko and Sergey Volkov aboard the ISS for four days until the planned arrival of replacement crew on 15 December. The new guests will be Brit astronaut Tim Peake, cosmonaut Yuri Malenchenko and NASA's Tim Kopra, who'll launch from Baikonur atop a Soyuz rocket, ahead of a six-month stay aloft.